Leading Philippine telco and digital services provider PLDT and mobile leader Smart Communications together with broadcast station TV5 bring the much anticipated Miss Universe 2016 closer to Filipinos everywhere through digital and social media services running on the country’s most extensive and robust fixed line and wireless networks. 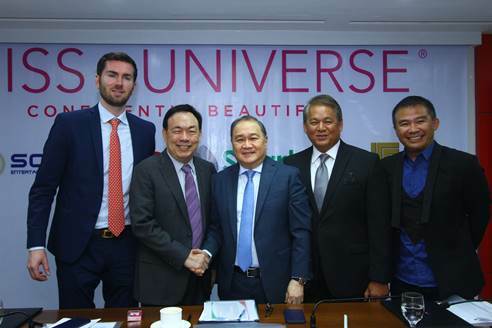 In partnership with the Miss Universe Organization and official Philippine broadcast partner of Miss Universe 2016 Solar Entertainment, the PLDT Group will enable the best viewing experience of the pageant in the Philippines through its various terrestrial and digital channels, across multiple screens at home and on-the-go. Shown in photo during the contract signing event held recently at PLDT RC Building in Makati City are, from left, Miss Universe Organization Business Development and Marketing Vice President Shawn McClain, Solar Entertainment Corp. President and CEO Wilson Tieng, PLDT Chairman Manny V. Pangilinan, PLDT and Smart Chief Revenue Officer Eric Alberto, and TV5 President and CEO Chot Reyes.